“Wasn’t that the answer to ‘Life, the universe and everything’ in Douglas Adams ‘The Hitchhiker’s Guide to the Galaxy’?”, I asked. 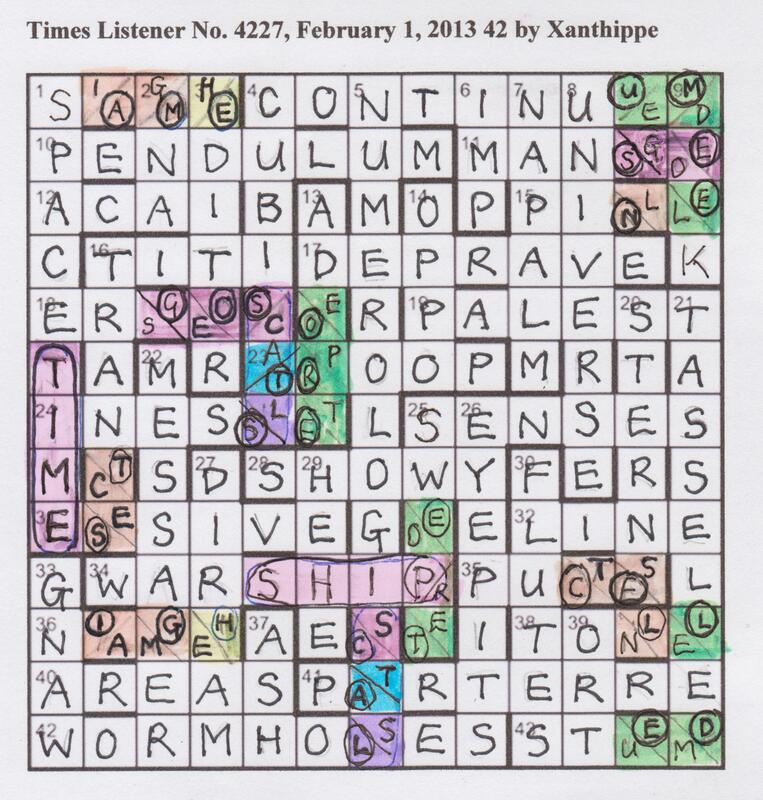 “You got it!” said the other numpty – so, in a way, we had a head start for Xanthippe’s 42. All the same, that short preamble was worrying. I’ve commented before that short preambles seem to accompany complex endgames. For us, at least, this was no exception. The early ease of solving didn’t reassure us either. There were some gentle enjoyable clues like that &lit. ‘Fine musical instruments (5)’ F + LUTES, and ‘Celeb backing English chap (4)’ E MAN rev, and our grid was soon three quarters full. That was when our problems began. There was no mention of clashes in the preamble but clearly there were lots of them. We had spotted SIGH (‘Mercury is reflecting sound of wind (4) Hg + IS rev) but it clearly would not sit comfortably with MNA ‘Man forged Greek money (3)’ or EDITOR at 3d. Conscious now that there were clashes, our solve became rather more careful. Not careful enough, though. C?N?INU?M went in as CONTINUUM. We already had MEEK (‘Submissive male sound of one who’s frightened (4)’) and, at this stage, we had pre-empted all the wormhole wriggling and gone straight to the solution. We realized later that the clue actually led us to CONTINUED. With UNIVERSE and CONTINUUM in place, we decided that our SPACESHIP at 1d was somehow going to become SPACE TIME so that the 42 in the UNIVERSE (W?RMH?S?S) were going to become wormholes – those strange means by which matter is supposed to mysteriously move instantly from one end to the other. Some letter moving was required. 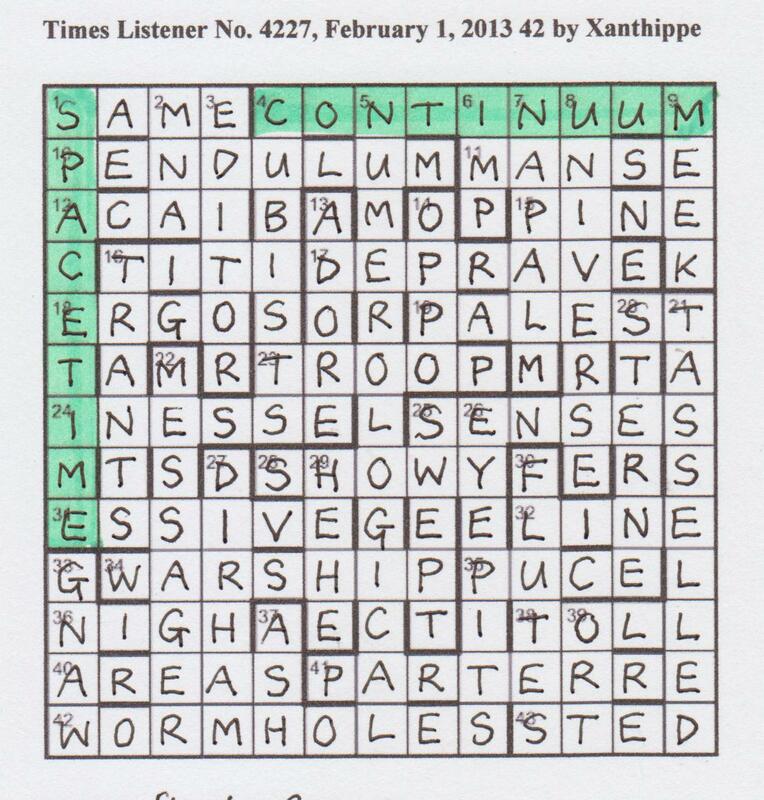 that Xanthippe had cleverly incorporated the unchecked letters that preceded those pairs so that we had to ‘wormhole’, the A and I, to produce NIGH and SAME. The brilliance of the construction dawned on us. The above scan of my grid shows what antics I went through ‘wormholing’ all those clashed letters until, ultimately, I had only real words in the grid. There had to be only eight pairs of affected words, though at first there seemed to be far more. 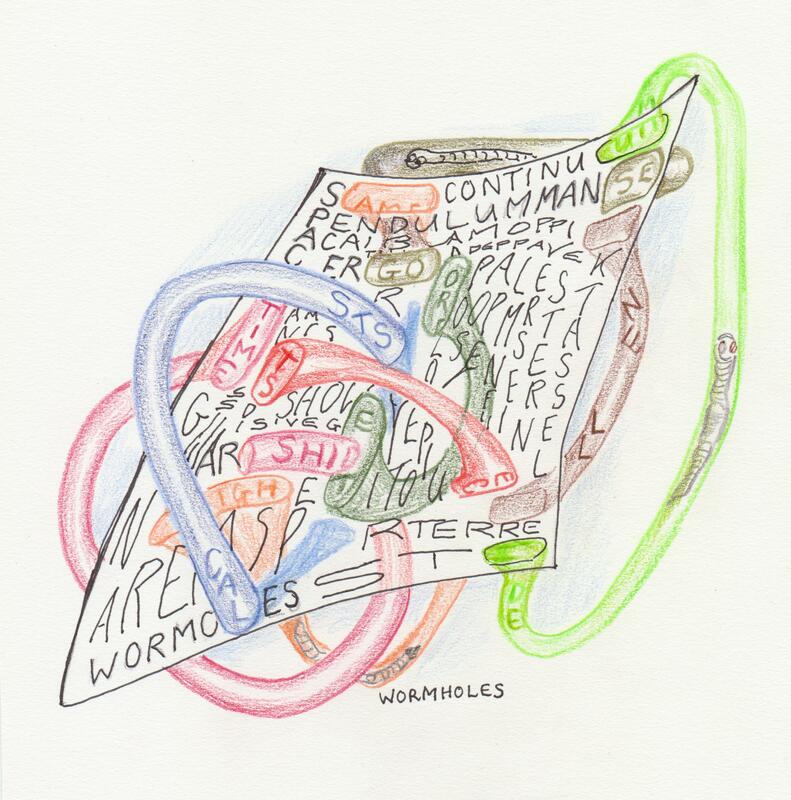 In the end, these were the wormhole changes we adopted: sAME/nIGH, spaceTIME/warSHIP, numerologiCAL/cubiSTS, tranTS/puCE, adORE/swEPT, piNE/toLL, erGO/manSE, and, of course, continuUM/stED. My weekly submissions must be dreadfully boring for Mr Green so perhaps I should send something colourful and different this week. I’ll see if I can produce this thing appropriately in 3D. Well, I tried! What a sense of achievement we had. We felt that this was quite a step up in difficulty from the puzzles we have solved so far this year. Many thanks, Xanthippe. This entry was posted on 22 February 2013 at 5:05 pm	and is filed under Solving Blogs. Tagged: 42 by Xanthippe. You can follow any responses to this entry through the RSS 2.0 feed. You can leave a response, or trackback from your own site. That illustration is fantastic! Took a puzzle that I felt was a bit dull to be honest and made the theme come to life spectacularly! Thanks Shirley! I had great fund doing it and it helped me understand what had happened.